Drew Taddia host of Exploring Mind and Body, interviewed Malcolm Saunders this week on Radio Laurier. Malcolm Saunders mission is to deeply connect people to their food. He has worked in the field of food and nutrition for 20 years and is the owner & creative visionary of The Light Cellar. 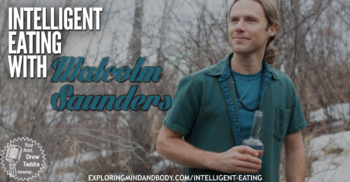 Malcolm is a public speaker and intuitive chef who specializes in sharing the alchemy of superfoods and superherbs. Through his videos, workshops and seminars he has helped thousands of individuals recreate their relationship to food. Malcolm has created events and shared the stage with world-renown speakers including David Wolfe, Daniel Vitalis, Sandor Katz, Nadine Artemis, Dr. Terry Willard and more.